Hurricane Hunter aircraft along with oil rig reports show that a closed circulation has developed. Winds of tropical storm strength were found by the Hurricane Hunter. Nate is expected to become a hurricane. 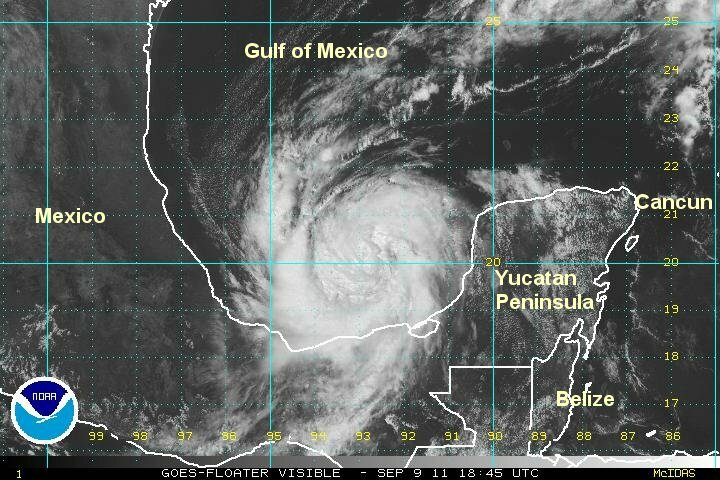 At 8 pm edt / 7 pm cdt Nate was centered at 20.4 N / 92.6 W or about 140 west of Campeche, Mexico. Top sustained winds estimated at 45 mph (NHC 45 mph last advisory). Movement: stationary. Pressure estimated at 1003 mb. Forecasts show steering currents remaining weak for the next couple of days. This will allow for Nate to stay in the Bay of Campeche. After this a general drift to the west into Mexico is expected. The hurricane center's cone of uncertainty is almost circular later in the period. This essentially means they have little confidence in the track. Interests in Mexico around the southern Gulf of Mexico and Bay of Campeche. Nate hasn't moved. The center of circulation is exposed, which is even visible on IR imagery. Many times low level features are hard to distinguish on IR satellite. Deep convection remains on the south side of the circulation near the coast of Mexico. 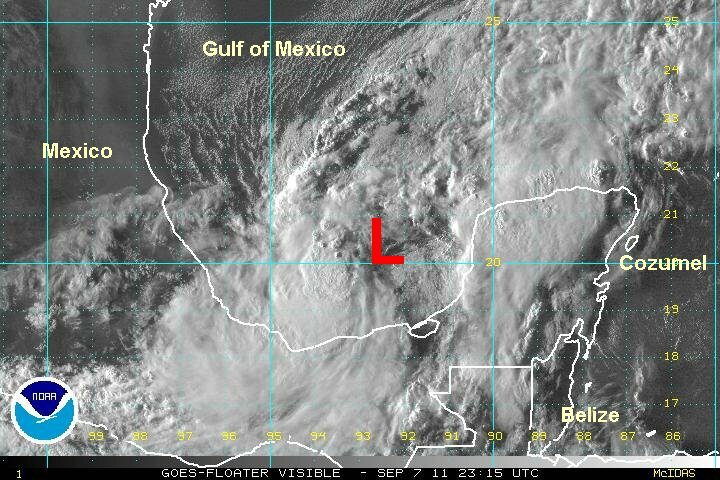 At 8 am edt / 7 am cdt Nate was centered at 20.4 N / 92.4 W or about 130 west of Campeche, Mexico. Top sustained winds estimated at 45 mph (NHC 45 mph last advisory). Movement: stationary. Pressure estimated at 1003 mb. Forecasts show steering currents remaining weak for the next couple of days. This will allow for Nate to stay in the Bay of Campeche. After this, a general drift to the west into Mexico is expected. The hurricane center's cone of uncertainty is almost circular later in the period. This essentially means they have little confidence in the track. Interests in south Texas and Mexico around the southern Gulf of Mexico and Bay of Campeche should follow Nate's progress. Nate still not showing much change today. I'll post at full update later this afternoon / evening. The hurricane hunter found flight level winds of over 90 mph. This is very impressive considering the satellite presentation. the wind was in the deep convetion south of the center. Nate will be a hurricane soon. 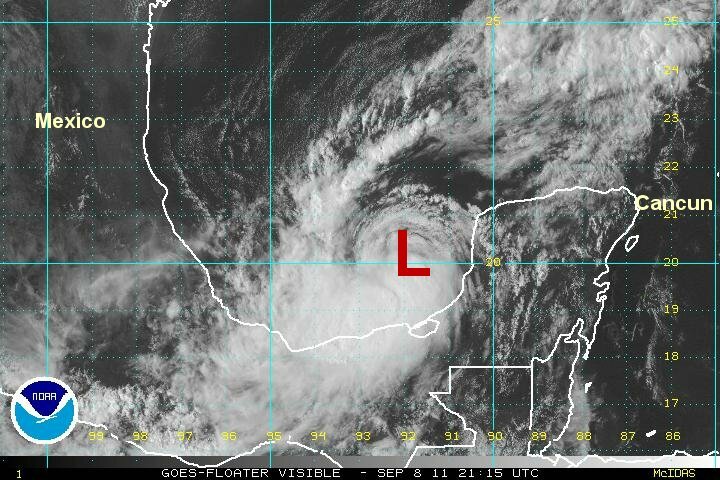 At 5 pm edt / 4 pm cdt Nate was centered at 19.7 N / 92.3 W or about 120 west of Campeche, Mexico. Top sustained winds estimated at 70 mph (NHC 70 mph last advisory). Movement: nearly stationary. Pressure estimated at 995 mb. Forecasts show steering currents remaining weak for the next couple of days. This will allow for Nate to stay in the Bay of Campeche. After this, a general drift to the north then west into Mexico is expected. The hurricane center's cone of uncertainty is almost circular later in the period. This essentially means they have little confidence in the track. The deep convection associated with Nate is markedly less this morning. This indicates that Nate weakened overnight. I am going weaker than the hurricane center's estimate due to the size to the convection area. The outflow and banding look improved though and I wouldn't be surprised to see a restrengthening today. Nate is still nearly stationary. 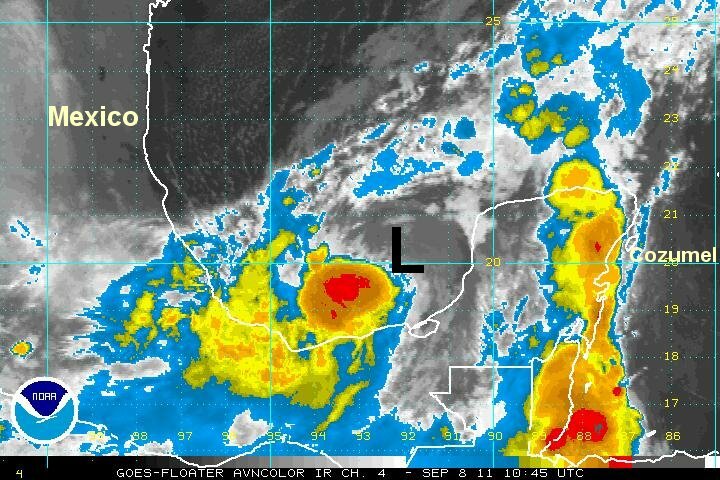 At 7 am edt / 6 am cdt Nate was centered at 19.9 N / 92.3 W or about 115 west of Campeche, Mexico. Top sustained winds estimated at 55 mph (NHC 65 mph last advisory). Movement: nearly stationary. Pressure estimated at 998 mb. Forecasts show steering currents remaining weak into the weekend. Sometime during the next 1-2 days Nate will start drifting northward then recurve west into northeastern Mexico well south of the Texas coast. Forecast models are starting to come into line with this scenario and it looks more like the probable track. Nate is trying to organize this afternoon with banding starting to appear. Winds are favorable for strengthening before moving into Mexico. 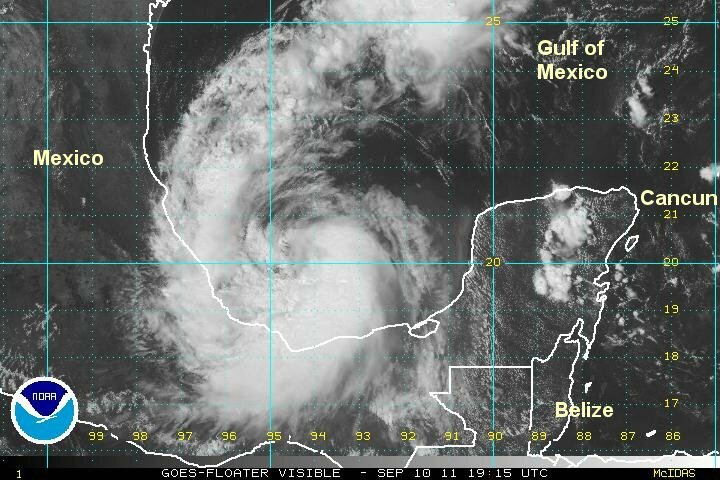 At 4 pm edt / 3 pm cdt Nate was centered at 20.1 N / 92.6 W or about 330 miles ese of Tuxpan, Mexico. Top sustained winds estimated at 55 mph (NHC 50 mph last advisory). Movement: nearly stationary. Pressure estimated at 998 mb. Forecasts show Nate generally moving west into Mexico into the western coast of the Bay of Campeche.....well south of the Texas coast. Nate is moving west toward Mexico where it will make landfall tomorrow as a strong tropical storm. There is a slight chance for Nate to become a hurricane before landfall. Nate also has a huge center of circulation - not an eye - visible on satellite. It is similar in size to Katia eye over the past few days. 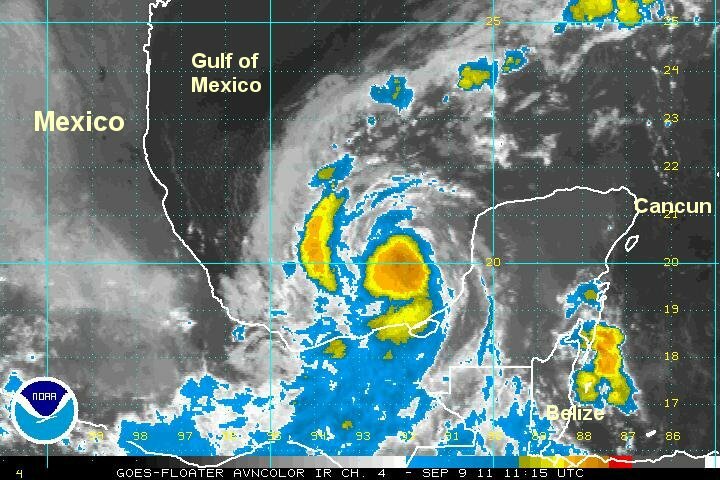 At 8 am edt / 7 am cdt Nate was centered at 20.0 N / 94.0 W or about 230 miles ese of Tuxpan, Mexico. Top sustained winds estimated at 50 mph (NHC 50 mph last advisory). Movement: west at 5 mph. Pressure estimated at 1000 mb. 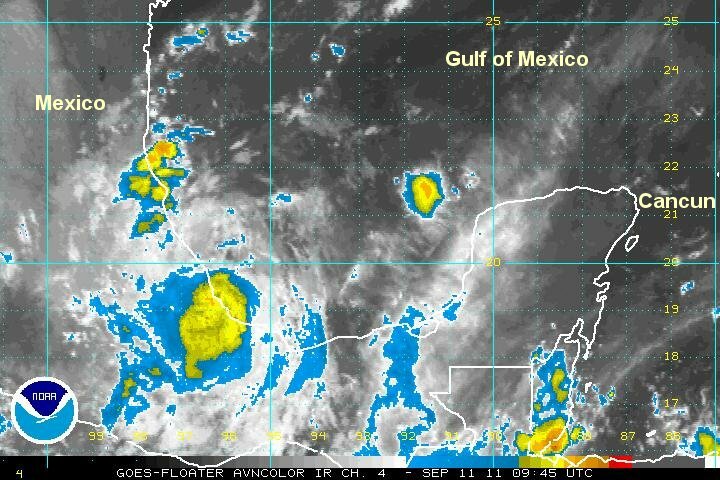 Interests in Mexico around the Bay of Campeche should follow Nate's progress. Nate is bringing heavy showers to the coast on the southern Bay of Campeche. A hurricane hunter found a wind to a little over 75 mph. The surface wind were closer to about 50 mph. Considering the satellite appearance and pressure, I am estimating a little lower than the hurricane center's wind speed estimate. 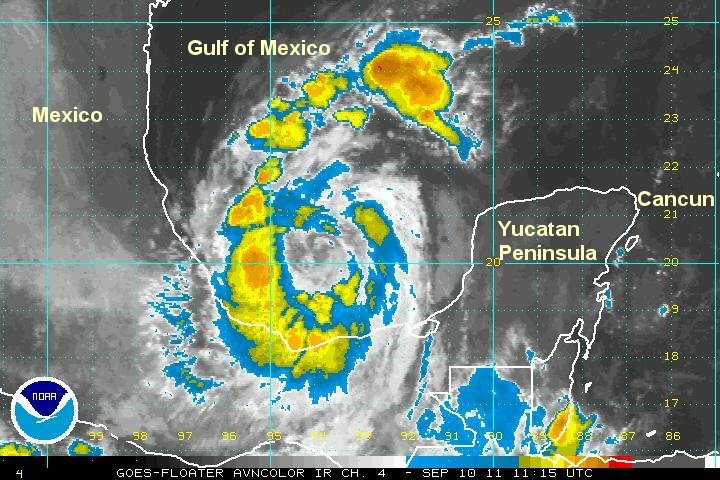 At 4 pm edt / 3 pm cdt Nate was centered at 20.3 N / 94.8 W or about 125 miles ese of Tuxpan, Mexico. Top sustained winds estimated at 55 mph (NHC 60 mph last advisory). Movement: west at 4 mph. Pressure estimated at 1000 mb. Forecasts show Nate generally moving west into Mexico into the western coast of the Bay of Campeche by Sunday morning.....well south of the Texas coast. Nate is just northeast of Veracruz, Mexico and will be on the coast shortly. Convection is weakening and Nate looks to be considerably weaker than the sustained winds of the official NHC forecast. 60 mph are high winds for a 1003 mb pressure too. Nate has also taken a southwesterly turn just before the coast. It will continue to weaken and be a depression by the next 3-6 hours as it continues inland. Nate will make landfall at or just north of Veracruz. At 7 am edt / 6 am cdt Nate was centered at 19.4 N / 95.9 W or about 25 miles ne of Veracruz, Mexico. Top sustained winds estimated at 45 mph (NHC 60 mph last advisory). Movement: southwest at 8 mph. Pressure estimated at 1003 mb. This will be the last update on Nate.